University of Alabama running back Derrick Henry posted an Instagram (the kids and their social media!) of his new car: A Dodge Challenger. 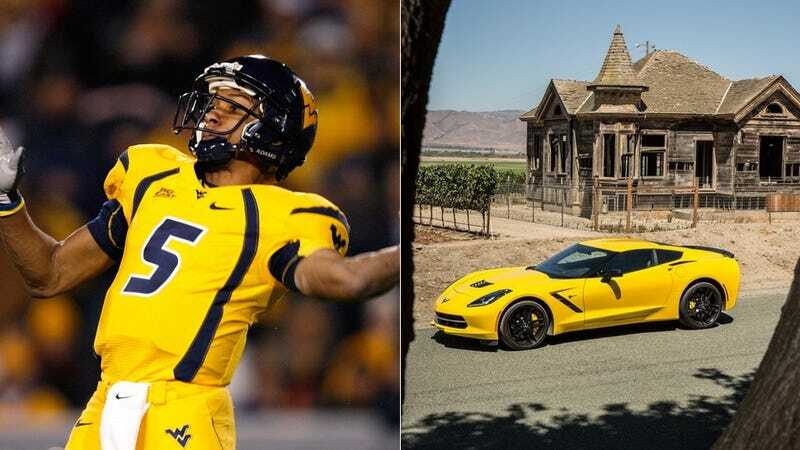 Former West Virginia University QB Pat White then jumped in, saying 'Bama has given out cars for years and he turned down a Corvette they offered. Every single time an NCAA athlete appears next to a new toy, whether it's a Playstation or a car, there is the assumption that some sort of impropriety has occurred. In this case, when Derrick Henry showed off his new Challenger, everyone started to suspect that the unpaid student athlete received it as a gift from his university. Especially Pat White, who claims an offer of a Corvette was made to him to play for Alabama in college. The actual quote from White is "Stop pretending like you didn't know the crimson tide has been doing this for years. Still glad I turned down a Corvette to become a mountaineer." As you can tell, he isn't too keen to say anything. There is some doubt about White's story that he was offered a 'Vette. Sources considered him a "three star athlete" and not a blue chip prospect. It seems unlikely to them that he would have been offered such a lavish gift to play for 'Bama. Pro tip to athletes: Don't take pictures of your new cars, gifted to you or not. Over and done.